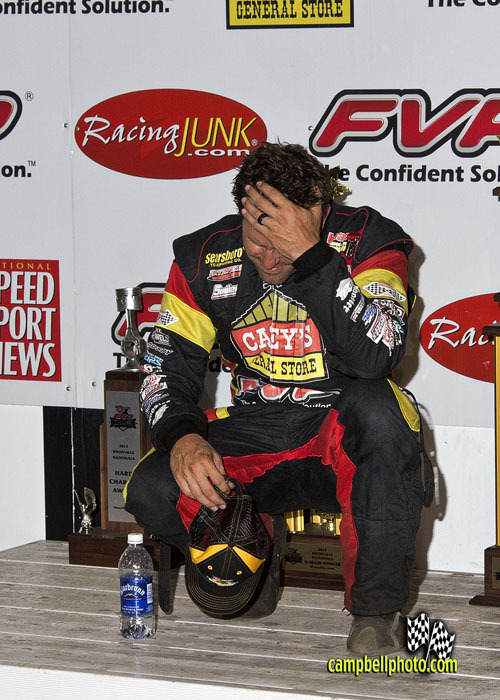 Knoxville, IA — (August 11, 2013) — Approximately ten hours after Donny Schatz’s victory Saturday night in the 53rd Annual FVP Knoxville Nationals I still don’t know if I have words to convey to you how astounding of an accomplishment it was. Schatz went to the biggest sprint car race in the world, winning a 22-lap B-Main on the final lap, and promptly driving by 20 of the best sprint car teams and drivers in the world in rapid fire faction is easily in my top three greatest things I have ever witnessed at a sprint car event. 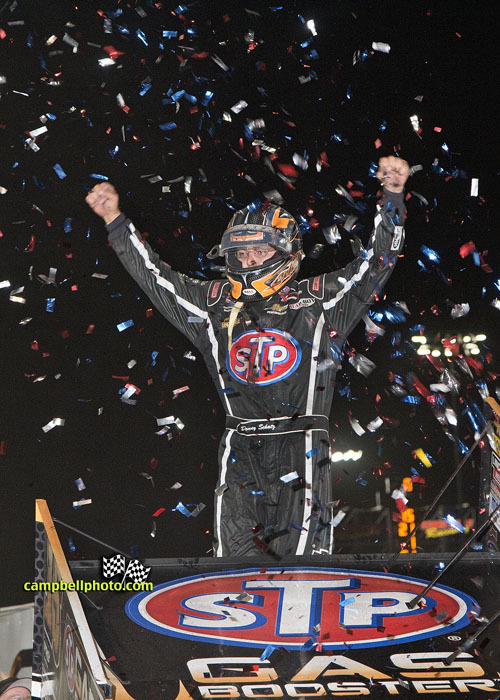 The victory is a testament to Schatz and the entire Tony Stewart Racing team. If you consider the emotionally hit when Tony Stewart broke his let at Southern Iowa Speedway on Tuesday, the lackluster performance (on the Schatz scale of Knoxville performance) on his preliminary night , and not securing the automatic transfer on Friday during the Speed Sport World Challenge it makes Schatz’s Saturday performance even more impressive. Some might credit the car change Schatz called for on Saturday morning to equipment he felt more comfortable in, but Schatz indicated in my interview with him after the race that the car reacted in the same manner the previous one did during the A-Main hot lap session. From there Schatz, crew chief Ricky Warner, and the rest of the TSR crew “threw the kitchen sink at it,” in Donny’s own words, and hit it out of the park. Adding in the factors of the track taking rubber early and other teams being able to make adjustments at halfway Schatz’s performance on Saturday night may not be duplicated again in my lifetime. 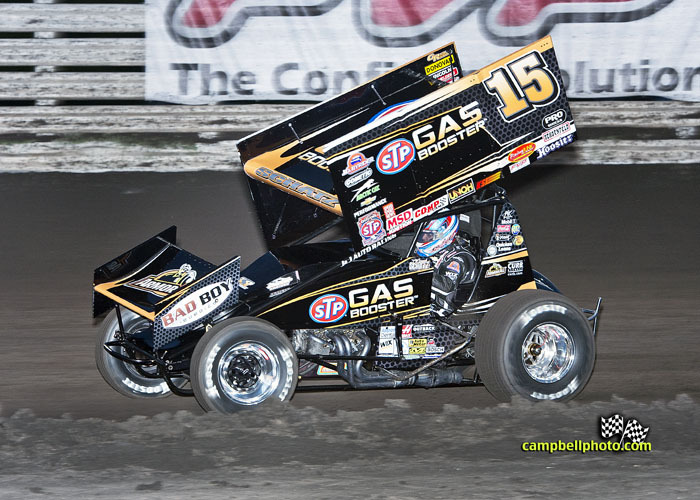 In winning on Saturday Schatz has now won seven of the last eight Knoxville Nationals Saturday night A-Mains, set a new record in relation to wining the event from where he started, and became the first driver to win the event coming out of the B-Main. Fans are sometimes almost mean spirited towards Schatz’s success because for a multitude of different reasons. From my perspective I enjoy the fact that Schatz might not be a ray of sunshine every time speaking with him and such because he’s honest. In an era where fans clamor for drivers to speak their mind Schatz does just that. One thing this stretch of success I believe has done for Schatz is make him appreciate fans that do appreciate his talent and realize he is starting to hit rare air in the sprint car world. Schatz even cited some fans that painted their chest in his honor, and almost on queue towards the end of the press conference could hear those fans chanting “S-c-h-a-t-z, Schatz! Schatz! Schatz!” much to Donny’s amusement. While it might come across to some as complaining I do feel Schatz has a great appreciation for history in the sport and wants to be a good steward for it in the future. Schatz cited how excited he was to see young drivers like Justin Henderson and Kevin Swindell on the podium with him, and talked about how he wants young people to look at him as a target for them to aim form when getting into the sport because he had people like Steve Kinser, Sammy Swindell, and Doug Wolfgang to admire when he was sitting in the stands at Knoxville Raceway watching as a child. One telling moment was just before Schatz left the media center he was clutching the hard charger trophy. I have a feeling that hard charger award will find a home in the Schatz family trophy case a reminder of how one of the greatest sprint car drivers in our lifetime overcame adversity to accomplish what has become business as usual at Knoxville. Like Schatz or not he is a guy that, “gets it” even though he might not show it in the same ways other drivers do. • One would be hard pressed to find a driver that handled Saturday’s defeat in the A-Main of the Knoxville Nationals with more class than Brian Brown. After a week of constantly hearing the message of how much the race means to him Brown was very complimentary of Schatz in the post-race press conference, just as astounded as the accomplishment of winning the Nationals from the B-Main as we all were. • Justin Henderson was another great story to come out of the Nationals. Fast ever since stepping into the Sunby racing car at Knoxville Raceway, Henderson did not even have a ride four months ago and found himself on the stage in the press conference for finishing in the top three at the biggest sprint car race in the world, narrowly wrestling away second from Brown. • Lower budget Ohio teams with drivers Chad Kemenah, and Cap Henry continued to impress on Saturday night’s A-Main event after earning positions in Friday’s Hard Knocks qualifying event. Kemenah drove up from the 19th starting spot to finish fifth while Henry picked up a top 10 finish. Both will likely help both small teams with momentum going into the remainder of their World of Outlaws and All Star Circuit of Champions schedules respectively. • As impressive as Paul McMahan is on the race track, his commentary during the KNIA/KRLS broadcast on Saturday was very enlightening. McMahan was extremely polished and amusing during the time he was on the broadcast. McMahan is talented enough that doing such a job once he decides not to race anymore would be a definite possibility. 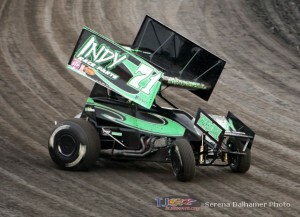 • One rivalry to keep an eye on going into this winter is Kyle Larson and Kevin Swindell. Swindell won the Mr. Sprint Car Title and made mention of winning in in spite of not running the non-wing race like Larson did. Larson and Kevin’s father Sammy had a run in during their preliminary night that saw them exchange words. Both of these young drivers are likely to square off again at future Chili Bowls and Knoxville Nationals over the next few years. • Kevin Swindell’s effort during the Nationals was exceptionally remarkable considering he had not driven a winged sprint car all season until the 360 Nationals last week at Knoxville. Even more impressive was teaming with Bernie Stuebgen from Indy Race Parts, who only races a handful of times all season as well. Stuebgen indicated that he was so busy at Indy Race Parts that he should likely not even be racing at Knoxville, but justified it as a twisted sort of vacation. 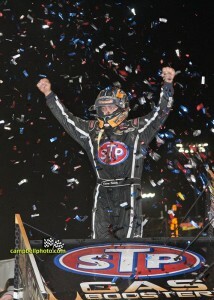 Stuebgen won at Knoxville earlier this season with Shane Stewart. Stuebgen indicated he was not sure when the Indy Race Parts #71 would return to the track due to his busy schedule. • The Knoxville Nationals could be a turning point for Joey Saldana and Motter Motorsports. After switching to GF1 Chassis Saldana earned the pole position, but did drop back to seventh in the feature. Saldana’s confidence seemed to grow during Nationals, which should help a team that is looking for their first World of Outlaws victory of the season.